Who wouldn’t like cake pops? Smushed balls of cake with icing, all dipped in some kind of confection, preferably chocolate. The possibilities are endless as far as flavors go. These apple caramel cake pops are really decadent. The addition of cinnamon, apple, caramel and cream cheese frosting to a simple yellow cake mix, produces something close to heaven. Roll it up and dip it in white chocolate and you literally have a sweet bite of autumnal Nirvana. Cake pops have swept the Internet like a tidal wave over the last few years, thanks in part to the delightful and amazing creations of Bakerella (however, I had my first cake pop at Starbucks). I decided to finally make some for Halloween. Mine are definitely not as beautiful and perfect as others I viewed, but boy are they tasty. The white chocolate coating, lent itself very well to a mummy or ghost theme. Some simple drizzling and black icing gel quickly made these a fun and “bootiful” treat (sorry couldn’t help myself). So here’s the process - you bake up a cake, let it cool, tear it into fine crumbs, stir in something to hold it all together, and roll it in balls. That part is super easy, especially if you use a cake mix. The tricky part is dipping the balls in melted chocolate or another candy coating. One trick is to dip your lollipop stick in the melted chocolate then put on the cake ball. Let it set and it acts as glue when dipping the whole cake pop in. You want the melted chocolate to be in a deep and narrow container for full coverage of the cake when dipping. I transferred my chocolate to a coffee mug with great results. It also helped keep the chocolate warm for successful coverage. I’m not going to lie. These took some time and patience. I am not a great baker or decorator. However, it was worth it. The apple caramel cake melted in my mouth and the white chocolate added a creamy sweetness like no other. They were gone in seconds when I served them to my children’s teenage friends. You can never get to old for a cute sweet treat. These are great for Halloween but also a beautiful and fun dessert for any occasion. Bake cake in a 9" x13" pan and let cool completely. In a large bowl crumble cake into fine pieces. Add frosting and caramel. Stir until completely combined. Cake mixture should be very moist and dense. Using a small cookie scoop, form tightly rolled balls. Place balls on a sheet pan lined with parchment paper and freeze for 15 minutes. Over a double boiler, melt white chocolate chips. Pour into a tall coffee mug. If chocolate is too thick for dipping, you can stir in a little bit of shortening as a thinner. 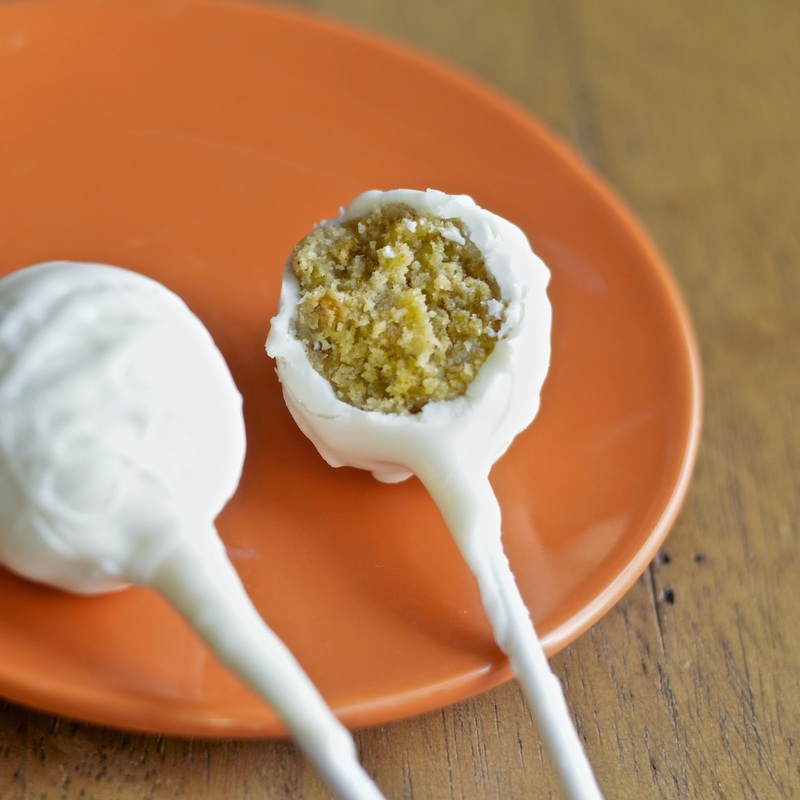 Dip a stick in chocolate and then into a cake ball. Let set for a minute and dip the cake ball in chocolate. Hold the ball over the chocolate to let the the extra drip off. Place pop in styrofoam to dry or set the ball on parchment if you don't mind a flat top (I did this with the ghosts). The chocolate should set very quickly. After all the pops have been dipped you can use the remaining chocolate to drizzle and make a mummy appearance or just a nice decoration. If making mummies or ghosts let all the chocolate set and add small drops of black icing gel for eyes. Those are almost too cute to eat! What a clever idea! I bet they were a huge hit!